Researchers have made a breakthrough in understanding what happens to the human brain after someone goes blind. The study out of the University of Pisa, Italy, found that the adult brain can actually learn to “see again” many years after a person went totally blind. The findings were published Tuesday in the journal PLOS Biology. So, does this mean we have found a cure for blindness? 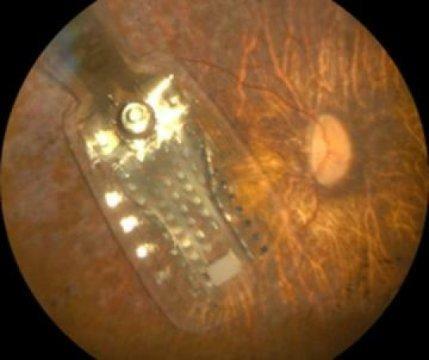 The answer is a decided “no.” But the work offers hope to researchers hoping to develop implants that can aid people who no longer have their vision. It helps answer the question of whether the brains of people who lost their vision could regain the ability to process “restored or artificial visual inputs,” the scientists explain in a press release. The team studied seven patients who have the hereditary condition Retinitis Pigmentosa, which causes cells in the retina of the eye to die off, resulting in vision loss and eventually total blindness. Each patient received a prosthetic implant that senses visual signals and sends them to the brain. These signals hit the brain by stimulating the long thread-like axons of the retinal ganglion cells that receive visual information. The researchers used functional MRI (fMRI) scans to look at the patients’ brain function and perceptual responses before and after the implants. Through imaging technology they discovered that the patients were able to recognize visual cues like flashes of light, for instance, which showed up as increased brain activity in the fMRI scans. And they got better with practice: The more patients were tested, the more their brains were shown to respond to visual stimuli. Essentially, more exposure they had, the better they were at perceiving visual stimuli with the aid of an implant. The research suggests that a human brain does have the ability to learn how to “see” again. The findings are significant because, globally, more than 40 million people suffer from some form of blindness. While a “cure” is still a long way off, these results boost hopes that more advanced implants could be developed to help people see the world better.